Deciding whether to repair or replace your malfunctioning air conditioner is not an easy decision to make. Replacing an old conditioner with a new one takes a large initial outlay of money. On the other hand, repairing an air conditioner that continues to break down needing repeated repairs can cost even more in the long run. While most homeowners invest in a replacement of their air conditioner if the cost of the repairs is more than 50% of a new air conditioner there may be other things to consider when faced with repairing or replacing your current air conditioner. If your air conditioner is making a great deal of noise then either the units indoor coil is malfunctioning, or the air conditioner is too small for the air you are trying to cool. In either case, it may be time to replace your air conditioner. Airconditioners like other appliances have a limited lifespan. Most air conditioner’s lifespan is 10 to 15 years, so if your air condition falls close to the end of its lifespan and breaks down, it is probably more beneficial to replace it then to repair it. Air conditioners not only cool your home, but they also lower the humidity in your home. Problems with either your ductwork or your air conditioning unit itself can result in rising humidity and inconsistent cooling. The money spent finding and repairing the problem may be more costly than simply replacing your AC unit. If your air conditioner is having airflow problems and you have already checked your filter, then the chances are that there are serious and expensive problems with your air conditioner and an air conditioner replacement may be needed. Problems controlling the air temperature of your AC leaving you to feel uncomfortable is a definite sign that there is some problem with your air conditioner. Your AC may be too small, there may be problems with the unit, or your ductwork could have issues. If you seem to be making continual repairs on your AC unit or ductwork then perhaps its time to replace that old Air conditioner. If your AC is not working at peak efficiency then your utility bills will be rising and if this is the case, it may be time to replace that Air Conditioner to save more money over the long term. Even if your air conditioner is fairly new if it suffers from unexpected breakdowns then perhaps it is time that you consider replacing your air conditioner for one that works as it should. 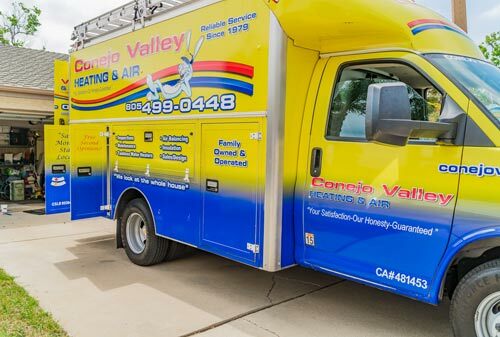 The Conejo Valley Heating and Air Conditioning company is owned and operated by residents who have been part of the Conejo Valley community for at three generations. As a local air conditioner replacement company, we care about our neighbors, which are also our customers. We have years of experience in AC repair and replacement as well as initial installation. Every one of our air conditioner contractors is fully trained in AC installation and repair. All of our employees are honest and dependable. We handle some top brands of Air Conditioners, so you have a choice of the best brand names. We do everything in power to make our services affordable. Our technicians will tell you whether repair or replacement of your air conditioner is more beneficial financial. When you hire our AC replacement service, you will know that having your AC replaced is the best choice for your bottom line. We can help to reduce your utility bills. We can offer you a variety of maintenance plans to keep your air conditioner working better for longer. We can often help to lower your utility bills saving you money in the long run. Your AC’s filters are meant to filter dirt from your Air conditioners inner workings so to keep your AC working effectively and efficiently then you should clean your filters to help your AC perform the job it is meant to perform. The age of your air conditioner is also going to affect the efficiency of your unit. As your unit gets old, its parts suffer from wear and tear which makes your unit struggle to work. Proper maintenance can keep your air conditioner running efficiently for longer. Over time weather can cause wear on your wiring causing those wires to corrode. Replacing those wires may well keep your AC working efficiently for longer than you may expect. While the above three factors do affect your AC systems efficiency, there are other factors as well. Worn parts, an AC unit too small for the area you are cooling and unexpected problems. Conejo Valley Heating and Air Conditioning is the ideal air conditioner replacement company for Conejo Valley and surrounding area.